Don't miss great opportunities nearby. Our neck of the woods has lots to do. Marengo Cave, the most highly decorated cave known in the Interior lowlands, offers a contrast and variety of underground splendor unmatched in any single cave. The natural wonders of this subterranean world will pass before your eyes as you glide silently over the quiet waters of Myst’ry River in a custom boat tour. This beautiful cave is filled with dazzling formations and underground waterfalls. Be sure to visit the gristmill and the craftsmen in the village as they go about their work. This park has tons of rides and a water park. #1 for family fun. Free soft drinks. Plus, there are hotels and camping nearby. These woods contain 25,457 acres of fun. Camp, canoe, swim, hike, bike, nature center, haypress, and tons more. Has four camping cabins. Fun for the whole family. Established in 1983, our full service canoe and kayak livery has a fleet of over 700 crafts plus our buses and vans we use to transport 30,000 yearly guests. Open Weekends Only: April, Sept. & Oct.
We are dedicated to providing a safe, fun, recreational experience for all our guests while preserving and protecting the environment of Blue River, Indiana’s first designated scenic river. 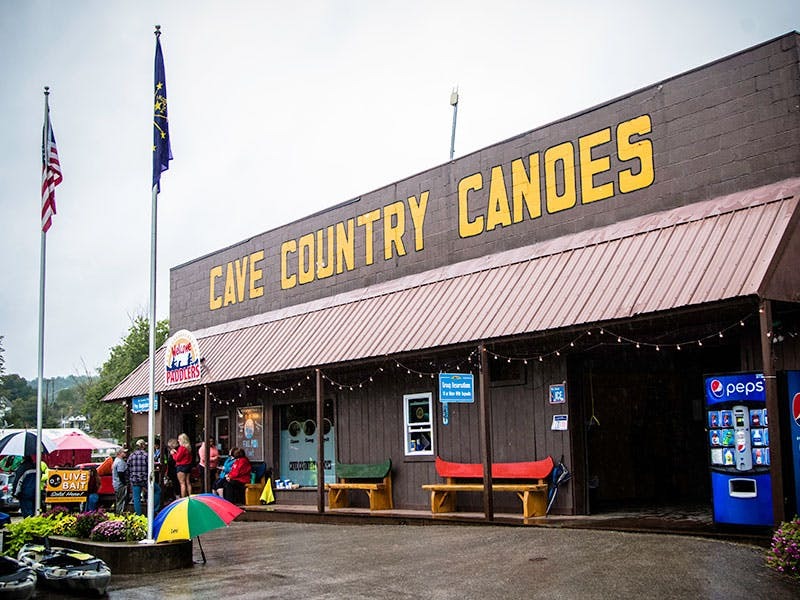 © 2011 - 2019 Cave Country Canoes. All rights reserved.